Publisher: George Allen & Unwin; then: Unwin Hyman; then: HarperCollins; then: Routledge. Country: United Kingdom. Date: 1979-92. London, George Allen & Unwin, 1985 (Unwin Critical Library). Hardback bound in black cloth. Dust wrapper. 228 pages. Size: 23 cm. ISBN 10: 0048000361; ISBN 13: 9780048000361. Series Note: "Each volume in the Unwin Critical Library deals with a single work of literature. This aim of the series is to offer interpretation and information at a high level of reliability and interest." -- Front flap of dust wrapper of: Montaigne's Essays - Dorothy Gabe Coleman. Allen & Unwin, 1987. In 1986 George Allen & Unwin became Unwin Hyman Ltd. The firm was later sold to HarperCollins and its academic list was sold to Routledge. Further titles in the Unwin Critical Library series were published by Unwin Hyman, HarperCollins and Routledge. The Aeneid - R. D. Williams. The Ambassadors - Alan W. Bellringer. 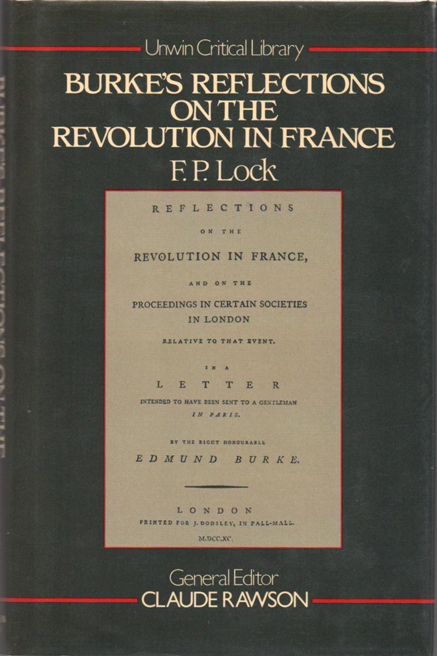 Burke's Reflections on the Revolution in France - F. P. Lock. The Canterbury Tales - Derek Pearsall. Don Quixote - E. C. Riley. Huckleberry Finn - Harold Beaver. The Iliad - Martin Mueller. Locke's Two Treatises of Government - Richard Ashcroft. Lord Jim - John Batchelor. Martin Chuzzlewit - Sylvere Monod. Montaigne's Essays - Dorothy Gabe Coleman. Paradise Lost - G. K. Hunter. Pope's Essay on Man - A. D. Nuttall. Pound's Cantos - Peter Makin. Robinson Crusoe - Pat Rogers. Shakespeare's Sonnets - Kenneth Muir. Tristram Shandy - Max Byrd. The Waste Land - Grover Smith.